You are currently browsing the tag archive for the ‘NSW State Government’ tag. An article was published in Reuters Health this week about research done by Dr Robert A Silverman of the Long Island Jewish Medical Center in New York. Dr Silverman studied the link between particulate matter (pollution from vehicles & coal-fire power plants) & 8,000 heart attacks in New York City between 2002 & 2006. “When they looked at fine particulate matter (particles 2.5 micrometer or less in size), they found that the risk of having a deadly cardiac arrest rose by between 4 & 10% with every 10-microgram-per-cubic-meter increase in fine particulates.” The current EPA standard of 35 micrograms per cubic meter is grossly inadequate. In 2003 there were 204 million vehicles on the road in the US. 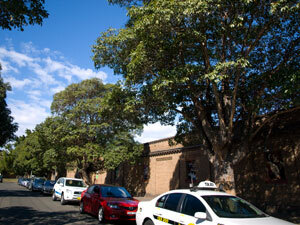 This increased to 246 million vehicles on the road by January 2010. In 2009, there were 50 million more vehicles on US roads than 6 years previously, though in 2010, it dropped to only 46 million more. In comparison, China is estimated to have in excess of 70 million vehicles on the road by the end of 2010 & expected to have over 200 million by 2020. Still they wont have caught up with the Jones’s. Australian statistics were hard to get though I did find that 13.2 million vehicles, including motorcycles, were registered in Australia at 31 March 2003. I would expect the numbers to be much higher for 2010. Worldwide it is predicted there will be 1.2 billion vehicles on the road by 2015. Only the cost of petrol or a severe shortage of oil is going to bring down vehicle use numbers. You can see why most cities are trying to encourage public transport use, walking & cycling. Lastly, we come to trees. Trees remove up to 60% of street level particulate matter & dramatically improve air quality, which is why their presence is so important in high traffic areas. The more trees in an area, the better the air quality. 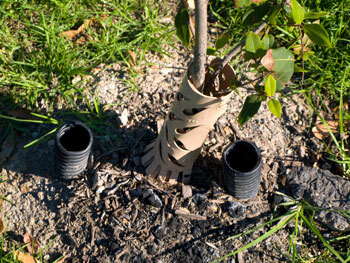 Trees also absorb other pollutants such as Ozone, Nitrogen Dioxide & Sulfur Dioxide through their leaves. A street tree removes 9 times the amount of air-born pollution from passing traffic than does a tree on a nearby property. Street trees also improve the air that enters people’s homes, especially important as particulate matter penetrates buildings even when the windows are closed. 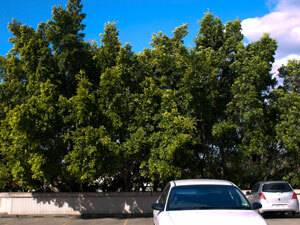 Large trees provide the most benefit as they provide greater absorption of particulate matter. Small stature trees that are the perhaps the most common sized tree across Marrickville LGA have far less ability to do this. The issue of pollution from vehicles is becoming an issue that is too hard to ignore. I am of the opinion that many of our roads in Marrickville LGA are quite dangerous in this regard due to the large volumes of traffic every day. Even small suburban streets that are more like lanes can have in excess of 7,000 vehicles/day. If the Marrickville Metro expansion goes ahead there will be a potential loss of 142 trees & an extra 4 million shoppers a year. You can just imagine the air pollution around the surrounding residential streets & the planned plaza. 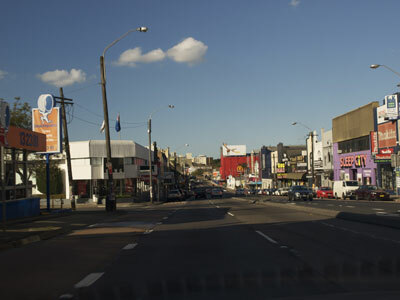 Parramatta Road & the Princes Highway are mostly treeless in the section that is under the governance of Marrickville Council. It’s not just a matter of beautifying areas that are seriously lacking in aesthetic beauty, it is a matter of public health. This problem is not going to go away. 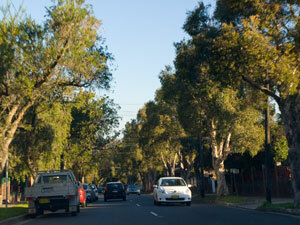 I think the NSW state government should allocate money to Marrickville Council to plant trees on these main roads. 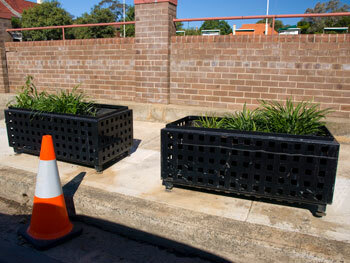 This is a major project requiring funds that Marrickville Council cannot afford. For this reason it is imperative that the state government fund it as a special environmental project. 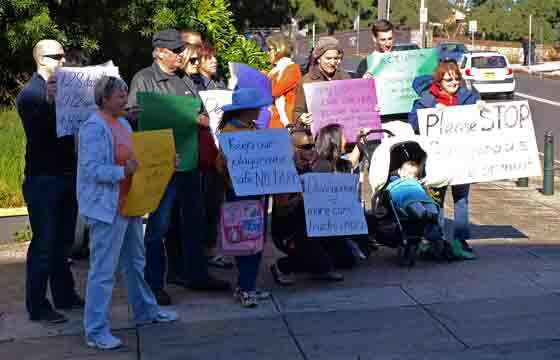 It will save the government much greater amounts of money in the long run as people living in Marrickville LGA may just end up in the health-care system. The population of Marrickville LGA is going to expand. We will all be living & shopping closer together & despite what the authorities say, I believe that the ‘culture of the car’ is not over by a long-shot. If I am correct, then the issue of pollution-related illness from vehicles is going to spike in the Inner West & we are going to need many more trees to try & lessen the particulate matter that the residents & workers are breathing in. On 29th June 2010 I posted ‘Living close to a main road is bad for your heath’ which discusses this issue further. This was the Development Assessment Committee Meeting. Absent: Clrs Peters & Wright. Mayor Iskandar & Clr Hanna were both very ill & I hope they get better quickly. The following is my understanding of the meeting & all mistakes are mine. The Gallery was full mostly with the community who came for Item 8 – the Marrickville Metro expansion. This was dealt with first & I did not remain for the other agenda items that were DAs for individual houses. Part 3A Redevelopment of Marrickville Metro Shopping Centre – Clrs Hanna, Macri & Thanos declared a pecuniary interest because they own shops in Dulwich Hill & Marickville & left the chamber. Clr Hanna is also the President of Marrickville Chamber of Commerce. Marrickville Metro want to buy Smidmore Street. Every bit of green is a tree at risk of removal. 4 people spoke, 1 for the expansion & 3 against. The person who spoke for the expansion worked as a taxi driver & said his previous work as an engineer made him have much concern for various aspects of the plan. He said that the Metro plan has 3 taxi spots which is not enough as Marrickville Rank is the main place to get jobs in the area. He had assessed the roads around Marrickville Metro & thought the levels suggested in the Drainage Report were insufficient & needed to be lowered 1.5 metres. The parking also needed to be lowered with standard barrier kerbs. He thought that as Murray Street was the major access for trucks, when they back into ramps they will block traffic substantially. He reminded Council that Marrickville Council IS the Roads Authority & the sale is not part of the plan. He said heavy-duty pavement was needed at bus stops & bi-pass traffic hasn’t been discussed. 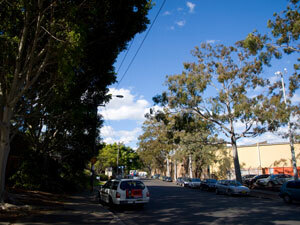 He wanted a deferred commencement until stormwater & overflow issues for Murray Street, Edinburgh Road were addressed. He said he presumed Council will sell Smidmore Street & therefore didn’t include the issues of this street. He said the roads sit high while drainage sits under concrete ramps. He finished off with saying at least $1.5 million for road construction is needed before the Metro expansion goes ahead. Clr Tsardoulias said Marrickville Council doesn’t want the Marrickville Metro expansion to go ahead. Clr Byrne said Council will not consent to sell Smidmore Street & that a Marrickville Metro expansion will have a detrimental impact on both Marrickville & the broader community. She said it was blindingly obvious it was a bad idea, that the plans are flawed & she was surprised it has got this far. She thought the loss of employment & the loss of trees are issues that need to be included in Council’s Report & reminded the community that the Minister for Planning is the final decision maker. Clr O’Sullivan spoke about the devastation to shops on Glebe Point Road because of the Broadway Shopping Centre & Double Bay shops because of Westfield. She said the concept plan was amorphous & slippery & conducive to concealment. She also said IKEA will not be renewing its lease at Rhodes so Edgeware Road will become an artery. Clr Phillips spoke about Marrickville Metro’s glossy PR shots which are deceptive & don’t show all the empty shops around the LGA. He thought their survey saying that most people want an expansion is also quite deceptive. He said Council doesn’t want the Town Centre at Metro & he didn’t support the sale of Smidmore Street. He said AMP Capitol want a voluntary agreement of $800,000 to allow for community infrastructure in Metro, but we already have our own libraries & this is private space. He mentioned 1,000 extra cars/hour on Saturdays & 500 extra/hour on Thursday nights. He said if it wasn’t a Part 3A, it wouldn’t have a hope of being approved through Council. 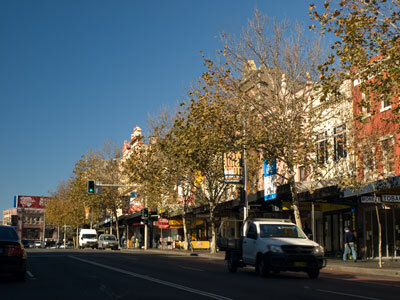 Clr Olive said that 13-55 Edinburgh was prohibited for reuse & that Marrickville Council’s Urban Strategy has never endorsed this kind of development. He said if the Minister approves it, he will be going against what the NSW state government has been telling Council for many years is not permitted. It should not go ahead & will be a detriment to the community. Mayor Iskandar said we will fight the Metro expansion & we will win. Clr Kontellis said Metro has been working on this for many years, that they asked for rezoning & it was given. She said 95% of Part 3A applications are approved & she felt cynical. 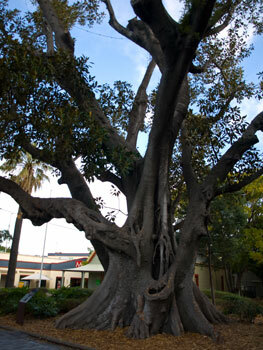 This is a seriously big Fig with a girth of many metres. 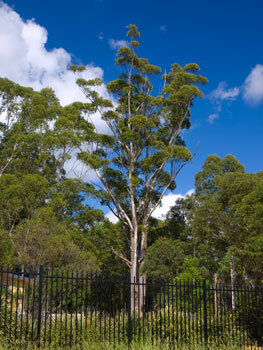 It stands near the front entrance of Marrickville Metro on Victoria Road. Council’s Report & that Anthony Albanese had told him earlier that in excess of 500 submissions against the Marrickville Metro expansion have been received from the community. He said if the expansion goes ahead, local shops will have to drop staff & stay open longer to make up the difference. One major aspect of Council’s Report is a recommendation to take Metro’s application to an Independent Hearing & Assessment panel (IHAP). This will allow the community another opportunity to speak about their objections to the plan. The motion that Council make a submission along the lines of the report prepared by staff was carried unanimously. 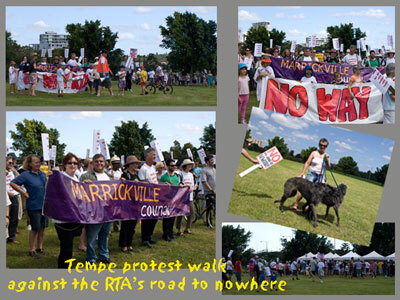 The ‘No WAY RTA’ banner carried by local residents led the walk closely followed by the Marrickville Council banner carried by Councillors O’Sullivan, Olive, Peters, Phillips, Byrne & Mayor Iskandar. State Greens MP Lee Rhiannon also attended. Many people expressed disappointment that other State & local MPs were not in attendance. After a few minutes the crowd progressed to the tent & listened to the speaker. 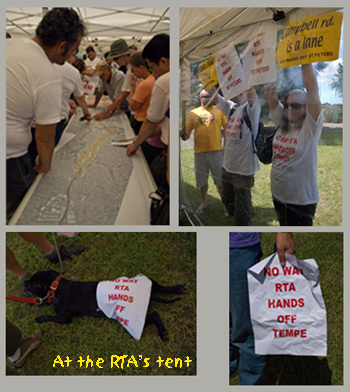 The protesters respected that the RTA staff had a job to do & did not interrupt. Besides, the information about this road has been vague, so everyone wanted to know the details of what was being proposed. I asked about the location & height of the 4 lane arterial road & how many trees will be chopped down to achieve this. The staff member said he had no idea, acknowledging, “Some trees will have to go.” He did however, show me the route of the road & said, “It will be at least 10 metres above the ground, higher in some places.” He said the road could not travel along the Alexandria Canal because it will cross the flight path. Another person pointed out that the intended route put the road on top of a hill travelling in the same direction & this would also affect the flight path so the rationale didn’t make sense. I think there is a plan cooking somewhere to build units along the Alexandria Canal. This road is of great concern because of pollution, noise, impact on the community, respiratory illnesses, damage to Tempe Reserve & the park on Kogarah side & both the Cooks River & the Alexandria Canal & will increase traffic through Newtown, St Peters & surrounds. Community group Tempe 2020 are there to provide details about how this road will affect their community (see What’s on page). SoT is concentrating on the impact it will have on trees, wildlife, the river & the Tempe Wetlands. 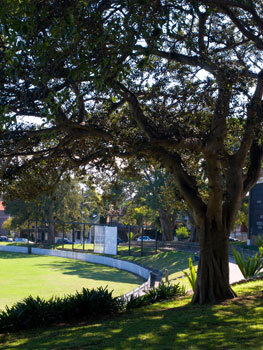 The well-utilised beautiful park on the Kogarah side of the river will be massively affected. Here, I have photographed cormorants drying off their wings on the banks of the Cooks River. It is filled with wildlife that will be severely impacted by the making of this road & the addition of thousands of vehicles speeding past each day. Tempe Reserve is a beautiful park in its infancy. 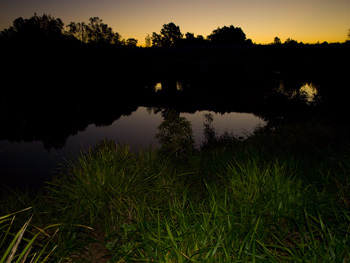 Marrickville Council have spent millions repairing it & creating biologically diverse areas such as a salt marsh & ephemeral wetland to provide habitat for flora & fauna. In about 10 years it will look significantly more beautiful as the current works will have established themselves & the trees will have matured. It is used by many people 7 days a week & not just for sporting activities. I do not think the community can afford to lose either park to a major road. Most people are attracted to the point of the peninsula & Marrickville Council knows this because that’s where they put the barbeques, the playground & the seating & this is exactly where the RTA intend to put the road. 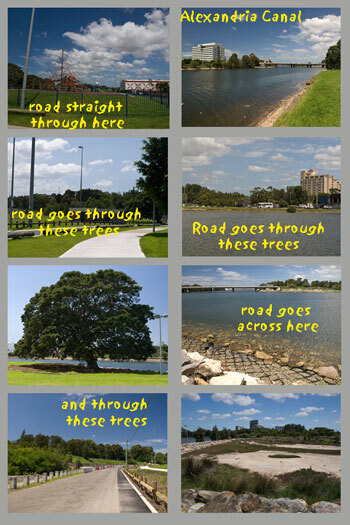 I feel annoyed that the State government & the RTA have so little respect & appreciation for these areas. I can only assume that they, as many people in Sydney, don’t realise just what a jewel this area is. Friends glaze over if I mention the Cooks River. Years ago they heard it was ugly & dirty & this has remained in their consciousness. Now it is full of lovely regrowth areas. The State Government should be doing everything in their power to protect Tempe Wetlands & the Cooks River, which is also highly visible as one of the gateways to Sydney from the airport. Sydney also needs to keep places like this for future generations & for wildlife. This is a densely populated area of the inner west with few parks per capita. The wildlife in my opinion is quite stressed with the rapid urbanisation & the continued loss of where they can live & find food. Stopping on the perimeter of Tempe Wetlands to take photos today, the air was alive with the sounds of insects humming away. Walk inside & you could be in a national park. Not everything of beauty should be destroyed for more roads. In my opinion, the State government are continuing to build this city for vehicles, not for people. As long as you encourage cars, roads will always be filled. Spend the money earmarked for this project on public transport, not for a road system that ends nowhere & is going to force drivers into crowded Alexandria and King Street that is barely coping now. 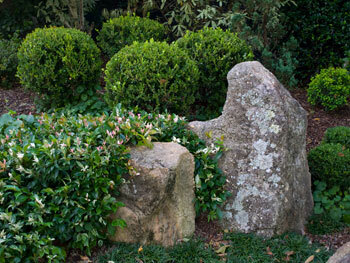 Let the wildlife have a little pocket for themselves. Future generations will thank you for it. Today I met a group of residents who have banded together to fight a Development Application for the old RSL site on Illawarra Rd Marrickville. The DA is to rebuild the RSL & erect a 7 storey 400 unit residential block, shops & a supermarket. This development is causing huge concern in the local community for a number of reasons – at 7 storeys, it will block views from Schwebel Street to the City, push noise back from the commuter & freight trains towards the hill, increase traffic on local streets, increase noise & create parking problems. The long opening hours of the shops & the removal of a pedestrian crossing opposite the park in Byrne Street is also worrying. Of great concern is the period of time the community is allowed to submit comment. It has been reduced from 30 days to 14. The group is concerned that most residents do not know about the development & those who do, don’t know the details. Marrickville Council are accepting submissions, but it is the NSW State Government who is decision maker for this development. Is this why it is being rushed through without meaningful community consultation? The deadline for submissions is THIS THURSDAY 27 August 09. If you are concerned, please write a submission & send to Marrickville Council mailto:council@marrickville.nsw.gov.au– DA200900288. The plans can be viewed at http://www.marrickville.nsw.gov.au/edrawer/DAInformation.asp?DANum=DA200900288 The groups contact details will be on the ‘What’s On’ page shortly.